Let’s say you’re working with a team on an important project. You have a few meetings, and you put together a plan. But not long after the tasks are assigned and everyone gets started, things start to fall apart. Someone misses a deadline. There aren’t enough resources. The outcome isn’t what you anticipated. Sure, it’s disappointing—but it’s also a learning opportunity. 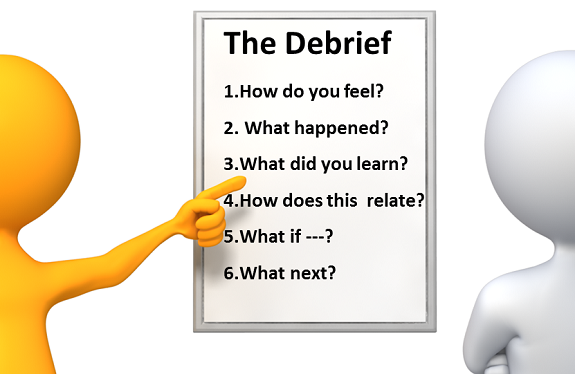 If you want to learn from what happened in the past and drive the growth of your team, you should get in the habit of debriefing. At the core of debriefing is reflection. Reflection-on-action occurs after an activity or project has taken place, when you and your team think about what you did, judge how successful you were, and determine whether any changes could have resulted in different outcomes. Through reflection, teams learn to communicate more effectively and relationships are strengthened. Ultimately, teams that are regularly debrief, perform more successfully. What Happened? So What? Now What? In this method for reflection-on-action, groups progressively reflect on a shared experience. First, start by collecting facts about what happened. Although this part of the debriefing is fact-based, you might start to hear varying accounts. What happened during the work? What did your team do during the exercise? What about the process stands out? Next, make sense of the facts by asking what you learned about yourself and others from the activity. So what have you learned from it? So what is your take on the events? So what is the meaning of all of this for you? Finally, discuss what actions should be taken and how you can transfer what you learned to the workplace. Now what are the next steps to put into action? Now what are you ready to commit to doing? Now what are going to do that could make a difference? What was in your mind as you started? What was happening for you when…? Action learning, a concept developed by Reg Revans, is an approach to solving problems that involves taking action and reflecting upon the results. Using this style of reflection, you start with small cycles of planning, acting, observing, and reflecting. What ought to be happening? These helpful models of reflective practice sequence questions for learning teams during a debriefing. Although it might take time for a team to adopt this technique of reflective practice, it will ultimately save you time and energy, as well as producing better outcomes over time. Looking for ways to take your leadership to next level? Consider a course in leadership development.